MicroRNAs (miRNAs) are crucial in the initiation and progression of tumors. A recent study has reported that the miRNAs miR-221 and miR-222 are involved in the promotion of an aggressive basal-like phenotype in breast cancer, functioning downstream of the RAS pathway and triggering epithelial-to-mesenchymal transition. These new insights into the roles of miR-221/222 in breast cancer metastasis, drug resistance and RAS pathways could potentially have applications in medical practice. The past decade has shown remarkable advances in our knowledge of microRNAs (miRNAs) and their functional importance in a wide range of developmental and physiological processes. These small endogenous non-coding RNAs, which post-transcriptionally regulate the expression of several hundred genes, have recently been shown to have an important role in various human cancers . There is growing evidence that miRNAs are critical in cancer predisposition, initiation and progression, with several miRNAs demonstrating oncogenic and/or tumor suppressor properties. In the past decade, several studies have focused on exploring the connection of miRNAs with tumor proliferation, invasion, migration and stem-cell behavior. Because of the widespread dysregulation of miRNAs in all types of tumors, their expression profiles are useful diagnostic and prognostic signature classifiers. miRNA expression analysis has confirmed that specific miRNAs show differential expression patterns among normal and tumor tissues. For example, the miRNA miR-10b is specifically overexpressed only in metastatic breast cancers but downregulated in primary breast tumors , and miR-335 and miR-126 are lost in relapsed breast cancers with distal metastasis . miRNAs are also found to be specifically overexpressed in resistant tumors with poor prognosis. Thus, specific miRNAs are involved in different phenotypes of aggressive cancers, providing an important rationale for their investigation as therapeutic targets. A recent study published in Science Signaling by Stinson et al. identified miR-221 and miR-222 as regulators of epithelial-to-mesenchymal transition (EMT) using high-throughput analysis and a human in vitro cell culture model. The study  reported miR-221/222 to be specifically expressed in basal-like breast cancer and to act downstream of the oncogenic RAS-RAF-MEK pathway. These miRNAs mediate metastasis through increased invasion and migration by targeted repression of tricho-rhino-phalangeal syndrome type 1 protein (TRPS1), which in turn increases the abundance of the EMT-promoting protein zinc finger E-box-binding homeobox 2 (ZEB2). Stinson et al. further explore the involvement of miRNAs in promotion of clinically aggressive metastatic breast cancer (Figure 1). Involvement of miR-221/222 as downstream effectors of the EGFR-RAS-RAF-MEK pathway in progression of metastatic transformation of breast cancer tumors. EGFR, epidermal growth factor receptor; EMT, epithelial-to-mesenchymal transition; ER, estrogen receptor; ERK, extracellular signal-regulated kinase; FOSL1, FOS-like antigen 1; GRB2, growth factor receptor-bound protein 2; MEK, mitogen-activated protein/extracellular signal-regulated kinase kinase; p27Kip1, cyclin-dependent kinase inhibitor p27Kip1; SOS, Son of sevenless homolog; TRPS1, tricho-rhino-phalangeal syndrome type 1; ZEB, zinc finger E-box-binding homeobox. The study by Stinson and colleagues  is significant because it substantiates the concept that specific miRNAs can promote transformation to more aggressive cancer phenotypes with poor prognosis. The authors performed miRNA microarray screening using multiple cell lines representing luminal-like and basal-like subtypes of breast cancer, and identified miR-221/222 to be differentially expressed. The overexpression of miR-221/222 in estrogen receptor (ER)-negative breast cancer has been reported previously , implying a role of miR-221/222 in predisposition of ER status in aggressive breast cancers. Transfection of miR-221/222 synthetic mimetics into an immortalized and nontransformed mammary cell line (MCF10A) resulted in a significant enrichment of genes involved in EMT and the RAS pathway. miR-221/222 induced EMT-like characteristics, with enhanced invasion and migration, increased levels of the mesenchymal marker vimentin and reduced levels of the epithelial marker E-cadherin. Consequently, treatment of MDA-MB-231 cells (a metastatic basal-like breast cancer cell line) with miR-221/222 inhibitors induced a reverse phenotype with mesenchymal-to-epithelial transition (MET)-like characteristics . The reversal to MET by inhibiting miR-221/222 is an important finding that can be therapeutically exploited, but more in vivo studies will be required before any significance can be established. In addition, the authors  confirmed the correlation between increased miR-221/222 levels and vimentin and E-cadherin expression in primary breast cancer samples. Previous reports  have established that miR-200 family members (miR-200a, miR-200b, miR-200c, miR-141 and miR-429) are downregulated in aggressive breast cancers. Thus, a combination of a miR-221/222 and miR-200 signature with other EMT markers such as vimentin and E-cadherin can provide a clinical predictive model for identifying patients with poor prognosis. The authors  further studied the regulation of miR-221/222 and reported a novel association between miRNA and the EMT-promoting RAS-RAF-MEK signaling pathway. They identified an upstream binding site for FOSL1, a member of the FOS family of transcription factors and, using chromatin immunoprecipitation and luciferase assays, they showed that the transcription of miR-221/222 is regulated by FOSL1. They identified miR-221/222 as downstream of the epidermal growth factor receptor (EGFR)-RAS-RAF-MEK pathway by showing that treatment with EGFR and MEK inhibitors knocked down the expression of both the miRNAs and FOSL1. TRPS1, a transcription factor with decreased abundance in clinically aggressive breast cancers, was identified as the direct target of miR-221/222; and in turn, TRPS1 targeted the EMT-suppressor protein ZEB2. Thus, repression of TRPS1 by miR-221/222 caused an increase in the levels of ZEB2, which directly inhibits E-cadherin and upregulates vimentin, promoting EMT. These results together reveal an intricate association between miR-221/222 and the EGFR-RAS-RAF-MEK cascade (Figure 1). In addition, the paper  highlights the functional significance of miRNAs in the process of EMT and stem-cell formation in breast cancer . The role of miR-335, miR-206 and miR-126 in suppressing breast cancer metastasis was initially described by Tavazoie et al. , who reported that selective loss of miRNA expression induced metastatic potential. Other studies reported increased expression of miR-10b, miR-21, miR-9 and miR-29b in malignant breast cancers , whereas the miR-200 family is downregulated in metastatic cancers . These miRNAs function at different stages of the multistep metastatic cascade, by acting as direct downstream effectors of oncogenes, sensitizing tumor cells to signals from the tumor microenvironment, or altering expression of EMT-related markers, such as E-cadherin and vimentin [7, 8]. The study by Stinson et al. elucidates a further layer of regulation that controls the EMT-driven cellular phenotype. The study provides a logical association between the earlier studies demonstrating the importance of miR-221/222 in metastatic breast cancers and drug resistance. An initial study by Zhao et al. showed that miR-221/222 directly targeted ERα and that their overexpression in breast cancer contributed to progression of the more aggressive ER-negative basal phenotype in a subset of breast cancers. miR-221/222 have also been shown to act as oncogenes by repressing cell cycle inhibitor proteins p27/Kip1 and p57 and thus facilitating cell proliferation and self-renewal . These functions of miR-221/222 both contribute to tamoxifen resistance in basal-type breast cancers. Stinson et al. 's study  adds an additional aspect to the story and links the basal-subtype-specific expression of miR-221/222 with increased abundance of mesenchymal markers and an enhanced EMT phenotype. It positions miR-221/222 downstream of the RAS pathway, targeting TRPS1 and thus increasing the abundance of EMT-promoter ZEB2; this provides a clearer picture of the mechanism of miR-221/222 in promoting aggressive breast cancer phenotypes with chemoresistance and poor prognosis. Finally, another important finding  is the involvement of different miRNAs in different phenotypes of breast cancer. 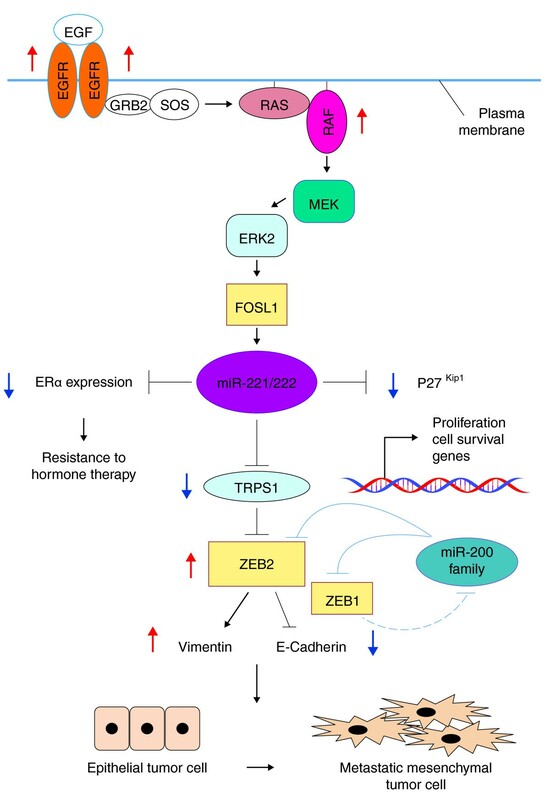 Previous studies have demonstrated that miR-200 family miRNAs act as EMT repressors by inhibiting ZEB1 protein; their expression levels are greatly reduced in metastatic breast cancers compared with normal tissues , and a negative feedback loop connects miR-200 family expression, ZEB1 expression and EMT occurrence . Stinson et al. discuss possible involvement of the miR-221/222 family in this feedback inhibition of miR-200 family members: they may act by relieving the TRPS1-mediated repression of ZEB2 protein and committing cells to EMT. Thus, regulation of the miR-200 and miR-221/222 families reflects a fine balance linking miRNAs as stimulators and inhibitors of metastasis and identifies important molecular targets that could potentially control a specific tumor behavior. In conclusion, these new findings  add yet another significant dimension to the regulation of the EMT phenomenon. The report presents a critical link between the EMT-related miRNAs miR-221 and miR-222 and the process of EMT and metastasis in aggressive breast cancers. The importance of Stinson et al. 's paper  rests in the identification of clinically useful miRNAs that act as regulators of EMT and represent not only a novel therapeutic strategy for the treatment of advanced breast cancer, but also potential use as biomarkers for clinically aggressive breast cancers with poor prognosis. Direct functional screens of global miRNA expression profiles in transformed tumor cells might help illuminate involvement of other miRNAs in EMT. Furthermore, the in vivo phenotypic consequences of miR-221/222 gain and loss of function in mouse models will help evaluate the practicality of miR-221/222 expression manipulation for therapy of human breast cancers. Identification of the as yet unknown targets for miR-221/222 also remains a key objective for the design of novel-miRNA-based therapy. Overexpressed miRNAs can be effectively inhibited in vivo using antisense oligonucleotides with specific modifications, such as cholesterol-conjugated antagomiRs, locked nucleic acid oligonucleotides or 2'-O-methyl modifications. However, several challenges regarding the stability and delivery strategies of these anti-miRs still need to be answered before they can be useful as therapeutic agents. More experimental evidence establishing that correction of a specific miRNA alteration can re-establish homeostasis and stabilize tumorigenesis is required. In this regard, the potential consequences of inducing MET in normal tissues during the course of miR-221/222 therapy also need to be determined. Thus, miRNAs hold great potential as therapeutic targets for new drug development; however, more insights into the functional consequences and efficiency of miRNA inhibition for patient survival need to be addressed. GAC is supported as a Fellow at The University of Texas MD Anderson Research Trust, and as a Fellow of the University of Texas System Regents Research Scholars program. Work in GAC's laboratory is supported in part by NIH grant 1R01CA135444, by a DOD Breast Cancer Idea Award, by Developmental Research Awards in Breast Cancer, Ovarian Cancer and Leukemia SPOREs, by a CLL Global Research Foundation grant, by a US/European Alliance for Therapy of CLL grant and by a 2009 Seena Magowitz - Pancreatic Cancer Action Network - AACR Pilot grant. We would like to thank Sunita Patterson (Department of Scientific Publications, MD Anderson Cancer Center) for her help with the editing of this article.